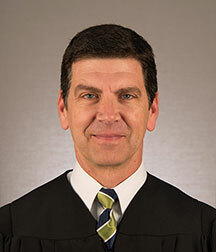 Judge Curt Kissinger was appointed to Hamilton County’s Municipal Court, District 4, in February 2015 and elected to retain the seat in November 2015. As a Judge, Curt Kissinger brings to the Court 25-years of courtroom experience as a prosecutor, civil and criminal litigation attorney and, most recently, Administrator of the Hamilton County Juvenile Court. Hamilton County is divided into seven Municipal Court Districts. District 4 is comprised of Anderson Township, Newtown, Mt. Washington, Mt. Lookout, Columbia-Tusculum, Hyde Park, Oakley, Fairfax, Mariemont, Norwood, Mt. Adams and southeast downtown Cincinnati. Judge Kissinger moved to Anderson in 1975 and graduated from Anderson High School in 1983. After graduating from the University of Cincinnati (’87) and the University of Dayton School of Law (’90), Judge Kissinger returned to Anderson before moving to Mt. Lookout and then Hyde Park. In all, he has lived in District 4 for twenty-eight years. Judge Kissinger began his legal career as an Assistant Hamilton County Prosecutor in the criminal trial division. He was responsible for the prosecution of felony and misdemeanor offenses in Common Pleas and Municipal Court. Curt Kissinger was appointed to serve as a special prosecuting attorney for the Ohio Organized Crime Commission, a multi-unit federal and state law enforcement task force created by the Ohio Attorney General to prosecute white collar and organized crime in Southwest Ohio. Judge Kissinger entered private practice with the litigation firm Rendigs, Fry, Kiely& Dennis representing individuals, business entities and insurance carriers in defense of personal injury, product liability, wrongful death, premises liability, business and employment claims in state and federal courts. Curt Kissinger also represented clients in defense of criminal charges including white collar and complex criminal proceedings. Judge Kissinger has appeared as counsel in the courtroom of every one of his judicial colleagues. In December 2011, Curt Kissinger became the Administrator of the Hamilton County Juvenile Court. As Administrator, Judge Kissinger supervised all aspects of court operations overseeing 289 employees, including 20 magistrates, the Court’s 160-bed secure detention center, and an annual operating budget of $25 million dollars. He also served as a magistrate for the Court as needed. As Court Administrator, Judge Kissinger implemented the private/public partnership to maintain the operation of Hillcrest Training School to preserve locally-based treatment options for youth and families. He also collaborated with the Ohio Supreme Court to complete the first case management review of the Juvenile Court. As an Adjunct Professor at the University of Cincinnati’s Blue Ash Campus, Judge Kissinger is an instructor in the Behavioral Sciences Department. He teaches in the subject areas of criminal justice and corrections. Both professionally and personally, Judge Kissinger gives back to the community. Coaching youth hockey, including starting Moeller High School’s junior varsity squad in 1986, advisor to Anderson High School’s Mock Trial Team, or Chairman of the Ursuline Academy’s annual Father/Daughter Dance for the past three years, Judge Kissinger values the importance community service. Professionally, Judge Kissinger was a member of the Hamilton County Ethics Commission. He has also served on the Board of Directors of HOPE for Children and Families, Journey to Successful Living, and Ohio Family and Children First. Curt Kissinger was also a member of the Hamilton County Republican Party’s Judicial Selection Committee.